Biolite Campstove Review - UK - Inspired Camping. A Biolite CampStove review for the UK has been long overdue, as this has been one of the most talked about products in the outdoor community for the past 12 months. With excitement growing of its imminent landing on our fair shores we were lucky enough to receive a sample unit for review and testing this week, something we have been eager to do since last summer. The BioLite’s appearance is more akin to a high-end gadget than a camping stove, coming in an attractive recycled cardboard box packed with a USB charging cable (for charging the internal battery), firelighters and other bits of supporting material. The unit itself is contained within a soft, black drawstring bag. Once unpacked, it is incredibly easy to assemble; simply click the two main parts of the stove together (the battery compartment stores inside the canister when not in use) and snap open the legs on the base to provide stability on the ground. Handily the BioLite CampStove comes with its own firelighters which you can use initially to get the fire started, easily achieved with a lighter or match. Once the fire is going you simply add kindling to gradually build it up, starting with smaller pieces and adding larger pieces as the fire becomes established. To this end we would recommend having a collection of sticks, twigs and natural fuel choices at the ready prior to ignition. Remember, wet or damp kindling isn’t going to get you great results, so if it bends rather than snaps then it’s probably no good. Once you have a small stack of dry kindling burning, you can put the fan into action on the low setting. This circulates oxygen inside the stove’s canister causing the wood to burn more efficiently and the heat and flames to intensify. Once fully alight you can ramp up the fan power to high to further increase the intensity. You can charge your Smartphone (or other USB chargeable device) by connecting it to the USB socket housed just below the power button. BioLite claim the stove can heat a litre of water in 4.5 minutes, which competes with the majority of commercial camping stoves out there. We used slightly more than a litre of water (0.6 litres was the capacity of the Sigg bottle dispensed twice) and put it in a pan on top of the blazing stove. It took roughly 6.5 minutes to come to the boil, slightly longer than the stated 4.5 minutes. However, in the stoves defence, we used a pretty heavy duty cast iron pan with no lid and 20% more water than quoted in BioLite’s stats. Additionally, when we tested the stove temperatures were below freezing and there was a 25mph+ wind. So, given the circumstances, the stove performed pretty darned well. When it comes to device charging you will excuse BioLite for not stating exact charge times. Factors such as the intensity of the fire and the battery within your device make it impossible to give precise figures around this. 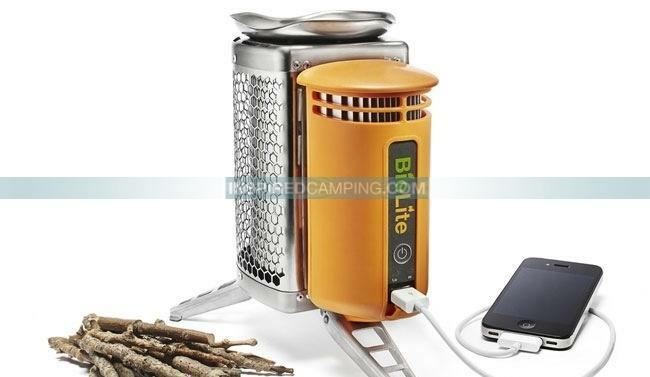 However, BioLite do estimate that an iPhone 4S will gain about 60 minutes of talk time from 20 minutes of charging on the CampStove. We decided that a fair test would be to see how much the BioLite would charge our iPhone in 30 minutes and were pleasantly surprised with the result. When we plugged it in, the phone had 23% battery, by the time it had finished, the battery sat at 37% charge. So for half an hours charging we got approximately 14% extra battery life. This is a real string to the BioLite’s bow, giving it an advantage over solar chargers that naturally depend heavily on sunlight, something we saw sadly too little of in the UK last summer. Granted the CampStove isn’t going to give you the same charging ability as plugging into the mains, however, it is certainly much better than running out of juice midway through a multi-day trek. So to conclude our BioLite CampStove review; we really liked it and consider it to be more than just a fad gadget. Although not quite glamping, it is probably one of a very few high-tech gadgets that have left both technophiles and environmentalists purring with excitement. A stove that doesn’t require the use of fossil fuels, needing only natural biomass to work, yet is able to charge your smart phone and other USB chargeable devices. This is certainly something that will engage the green natured amongst us. It may be pricier than many camping stoves on the market, but the fact you will never need to buy gas means it will pay for itself over time. Plus, we can’t think of any other lower priced stove that can charge your Smartphone on the go. About The Author: James Dale is Product Development Executive at Above and Beyond. UPDATE: For more information on the performance of the Biolite Stove, please view below or visit Amazon.